1) Energy Vampire. Become your favorite energy-sapping appliance. Fangtastic. 2) Pick a solar-related theme. Be it just a sunny day costume, or one of the many solar-related superheroes – Sunfire, Sunspot, Firelord, or Doctor Solar, Man of the Atom. 3) While on the subject of superheroes, you could copy a real-life one such as Eco Elvis (featured in the docu-comedy YERT). 4) Or how about transforming into Radioactive Man from the Simpsons? 5) If you are of the tree-hugging persuasion, there is even a website now for being green on Halloween (not just for the Wicked Witch of the West). 6) Turning our attention to electricity, how about Power Boy, or even dressing up as a Power Ranger? (it’s morphin’ time!). 7) If looking for something a little more weather-related, you can take your pick of superheroes; be it from Storm to Red Tornado, or from Thunderbolt to Lightning Lad. 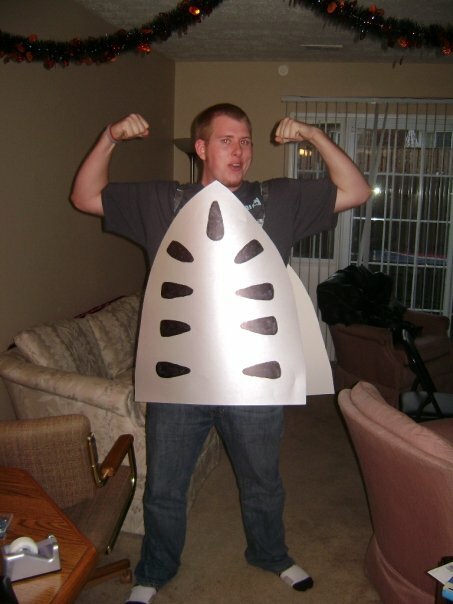 8) Or If you are full of energy, you could even make your own costume. 9) If trying to work the transportation route, you could be a Juggernaut, a gas tank (?!) or the out-of-this-world Sputnik 2. 10) Or finally, you could just be full of beans and dress up as an energy burrito…bravo!!! One last thing – last week’s competition was a washout because in retrospect the question was pretty dumb. So the prize rolls over to this week – the best energy-related costume in the comments wins a $20 burrito-related gift card. Game on! You, my friend, are the winner! !